EREC has sent three bunk trailers and a shower trailer to Gulf Coast Electric Cooperative in Southport, Florida, and two bunk trailers to West Florida Electric Cooperative in Graceville. These cooperatives received significant damage in Hurricane Michael’s devastating path through Florida. The trailers will be used by electric co-op crewmen during power restoration. One of the biggest challenges facing electric utilities during power restoration after disasters such as hurricanes is lodging. “It is difficult at best to find housing for hundreds or even thousands of workers in an area whose infrastructure has been devastated. For this purpose, EREC acquired trailers and renovated them into bunk housing,” said Clay Campbell, EREC General Manager/CEO. EREC’s five bunk trailers will sleep 33 people each, and the shower trailer has 10 showers and sinks. The trailers are self-contained, each equipped with its own generator. The sleeper trailers have central heat/air and individual lockers for each occupant. Each bunk has overhead lighting and electrical outlets for cell phone charging. The bottom row of bunks has nighttime floor lighting as well. 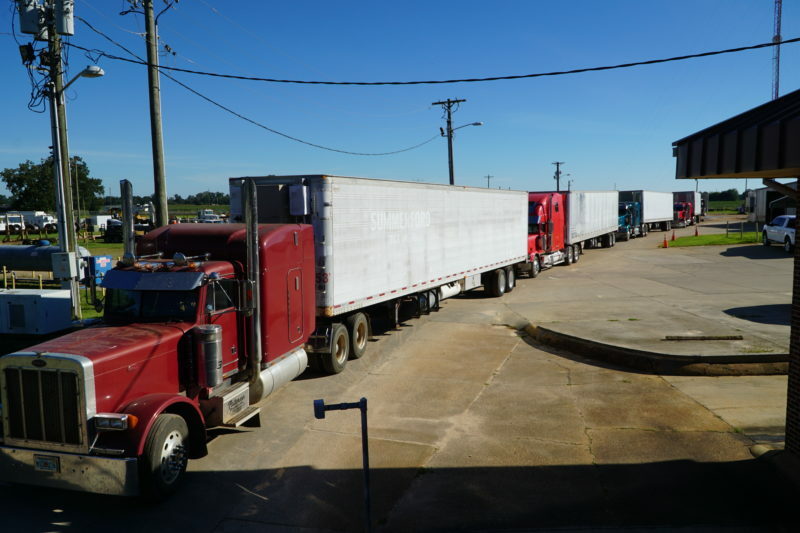 EREC bunk trailers for disaster relief roll out of headquarters to Southport and Graceville, Florida.